If you have a lower-body injury, be it acute or chronic, training for cross-country skiing can be frustrating: there are so many activities which must be cut back if you are trying to protect a knee, ankle, or foot. Luckily, there are good training options available, especially if you have access to a double-pole machine like an Ercolina or a Concept2 SkiErg. “I use the SkiErg a lot because I fight with feet injuries, and it is a safe escape from ski boots or shoes,” U.S. Ski Team and APU skier Sadie Bjornsen wrote in an email. Last season, Bjornsen won World Championships bronze in the team sprint with Jessie Diggins. This season, she is back to battling heel spurs. That’s why she has been putting in time on the SkiErg she has at her house, but she sees other benefits to these types of workouts as well. And as numerous research studies have recently shown, double-poling ability and upper-body strength are more and more becoming great predictors of overall ski performance, even in freestyle races. 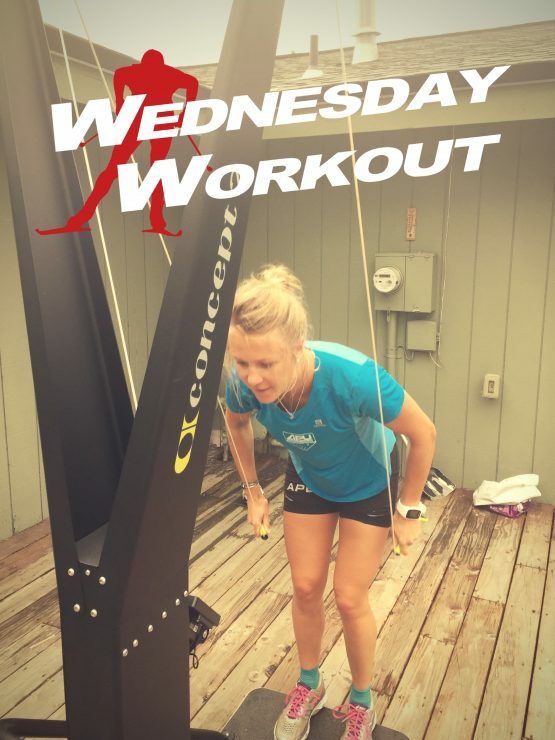 With that in mind, she shared a recent interval workout she did on the SkiErg — it’s bread and butter for Bjornsen. “I like to try to do this workout at least once a week all through the summer, and sometimes more if I am going through a period of struggle with my heel spurs,” she wrote. It aims for an hour of total workout time. Q: I’m a big fan of the SkiErg. When I workout I do a full crunch, bend at the waist and keep my legs straight, is this wrong? I notice from the videos that the demonstrators bend their knees and only half-crunch, so more arm involvement. A: When using the SkiErg, following the description you outlined from the demonstration videos is the correct way to go. You want to have a slight bent in the knees – never locked legs. The legs and ankles should be soft and supple and the feet placed at hip-distance width. You want to initiate the crunch from the upper abdominals, so eliminate the bend at the waist. It is important to use the core and arms in unison. Most of the power is going to come from the initial “pole” down when your hands are high, then follow through using the core (including the back muscles), lats and triceps. This is a more efficient way to double pole and will save you from back injury that can occur when you bend at the waist/hips. As you transition to this new technique, you may feel more involvlement from the arm, but over time you will become stronger and more efficient in the upper body.